Border counties are home to the largest share of residents living in poverty, while a few suburban counties contain the smallest shares of poor people, according to the latest poverty estimates released by the U.S. Census Bureau. The latest county-level poverty estimates from the U.S. Census Bureau, released in December, show that poverty is disproportionately distributed across the state. Among counties with at least 10,000 residents, border counties face the highest rates of residents living in poverty — nearly one in three people in South Texas. Meanwhile, suburban counties near the state's largest cities contain the smallest shares of poor people, with less than 10 percent of residents living in poverty in many suburbs. Though the share of poor Texans has gradually dropped in recent years, 17.2 percent of the state's population was still living in poverty as of 2014. The census determines poverty based on income and family size. For example, a family of four is considered to be living in poverty if their household income is less than $24,008 a year. 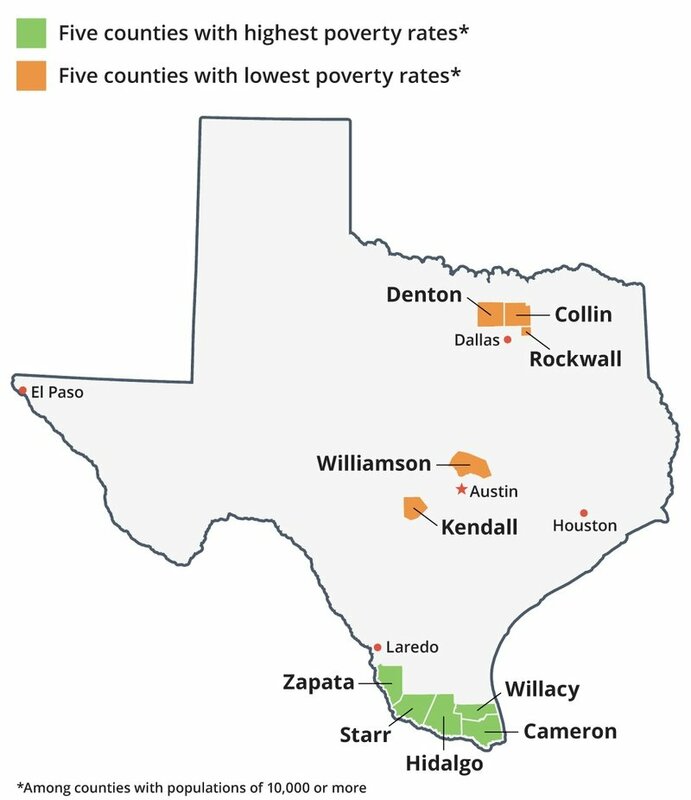 Here’s a look at the Texas counties with the highest and lowest poverty rates, among those with populations of 10,000 or more. Willacy County, just north of Brownsville, has the highest poverty rate in the state with 38.8 percent of residents living in poverty. It has the second-highest child poverty rate with 45.9 percent. Starr County ranked as the second poorest county in the state with 35.4 percent of its population living in poverty. Part of the Rio Grande Valley, the county is mostly made up of several small towns, including Rio Grande City. 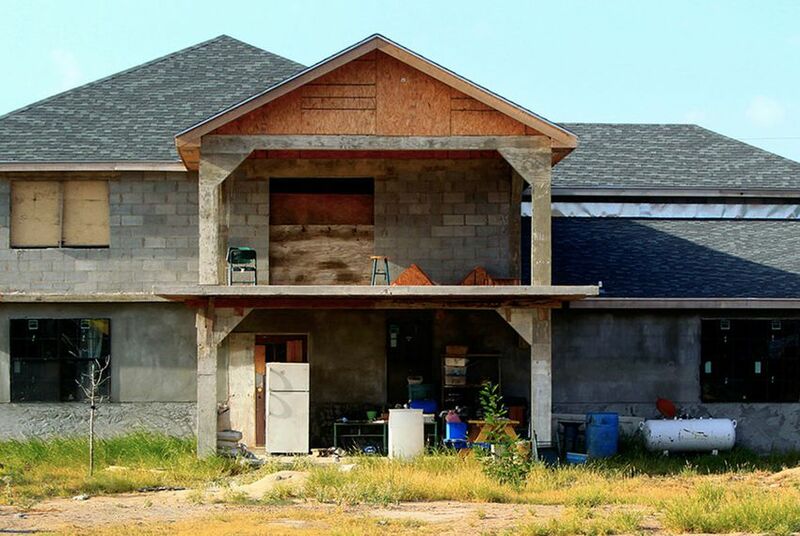 At the southern tip of the state, 34.5 percent of Cameron County’s residents are poor. Home to Brownsville and Harlingen, the county also has the highest child poverty rate in the state with 47 percent of children living in poverty. At the heart of the Rio Grande Valley, 33.5 percent of Hidalgo County’s population lives in poverty. Home to McAllen and Edinburg, the county also has a high share of poor children with 45.5 percent of children living in poverty. In Zapata County, 32.6 of residents are living in poverty. Just south of Laredo, the county comprises several small towns including the city of Zapata. 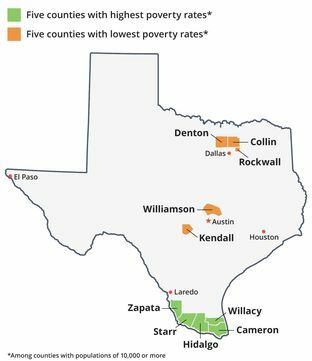 Rockwall County, located just west of Dallas County, has the lowest share of poor residents with only 6.8 percent of the population living in poverty. It also has the lowest child poverty rate with 8.9 percent of children living in poverty. Collin County ranked as the county with second-lowest share of poor residents with 7 percent of the population in poverty. Home to Plano and McKinney, it also has the second-lowest child poverty rate. Only 9 percent of children are poor. Just north of Austin, only 7.8 percent of Williamson County’s residents are poor. The county’s population is spread across cities such as Georgetown and Round Rock and includes many commuters who travel to Austin for work. Only 8.3 percent of the population in Kendall County lives in poverty. West of San Antonio, the county is mostly made up of small towns and is home to many commuters to San Antonio. North of the Dallas-Fort Worth metro area, 8.7 percent of Denton County’s population is poor. The county is home to the city of Denton and the University of North Texas.